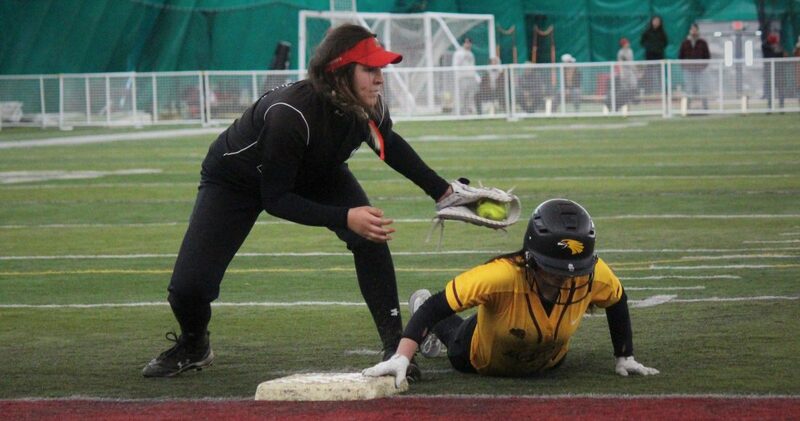 Alex Eisen/MDN Minot State first baseman Haley Hernandez (left) tries to tag out retreating Minnesota Crookston runner Leah Macias (right) in a softball game played Sunday afternoon inside the air-supported dome at Herb Parker Stadium. 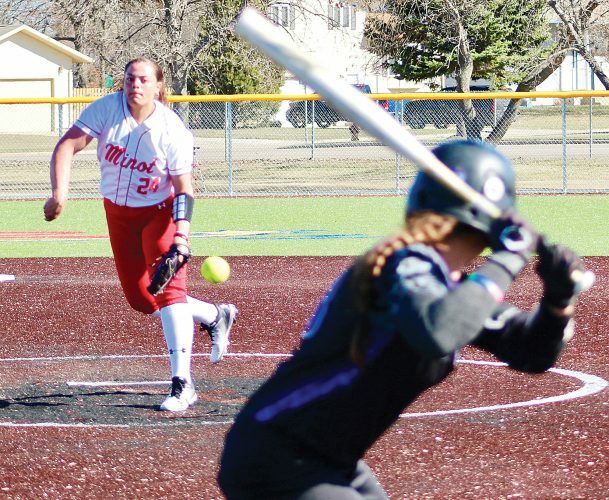 The Minot State softball team was an out away from an unbeaten opening homestand. So close, yet so far away. Minnesota Crookston came through with a two-out RBI single to force extra innings and then Maggie Morales finished the job off with an eighth inning grand slam that smacked a light fixture in deep right center field. Crookston (2-2) won 9-6 in eight innings and diminished some of the good vibes the Beavers (4-3) had after a 14-5 six-inning victory over Black Hills State (1-3) earlier in the day inside the air-supported dome at Herb Parker Stadium. Black Hills State opened the scoring in Game 1, just like they did on Saturday. Maddi Fidler singled to right center for two RBIs in the bottom of the first inning. MSU had the answer in the ensuing top half. Speedster Lauren Cowden took an unconventional trip around all the bases with an RBI triple and then scored herself on a throwing error over to third base. Taking a 3-2 lead after an RBI groundout by Julia Suchan, the Beavers piled on three more runs in the fourth inning off relief pitcher Crystal Amaral. Pinch hitter Jamie Odlum delivered a two-run single and Randi Wright chopped a ball back up the middle for an RBI single, 6-2. After BHSU squared up three straight hits and pulled back a run on MSU freshman starting pitcher Jordyn Staples, who was making her first collegiate start (second appearance), Kivett brought in junior transfer Monica Rivera to make her first appearance for the Beavers. Rivera was a strike away from working out of a complicated jam with runners on second and third base with nobody out. But, Alex Wiley drove in two runs with a single to get BHSU back within a run, 6-5. Rivera lasted 1 1/3 innings before Laura Mendez came in and cleaned up a bases loaded situation in the fifth inning to keep MSU ahead. Mendez got all the insurance runs she could have possibly needed with the Beavers batting around in the top of the sixth. MSU unloaded for eight runs off four hits and two errors. 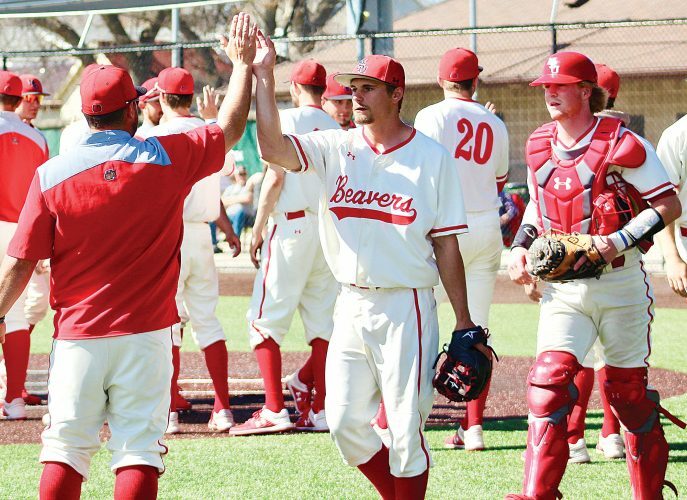 Coming into the game, the Beavers hadn’t scored more than seven runs in a whole game. 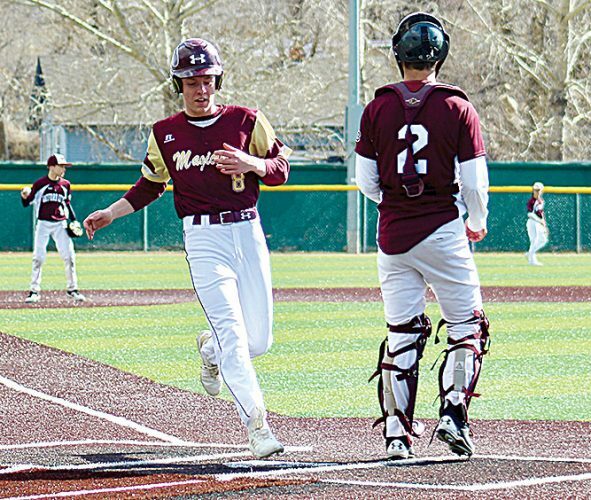 The outpouring of runs meant the Beavers only had to play six innings, as Mendez got the final three outs in the bottom half to enforce the eight-run mercy rule. MSU allowed Black Hills State and Crookston to play each other in the second game of the day so BHSU could get on the road sooner rather than later. BHSU put aside its 9-1 defeat to Crookston on Saturday and won 7-5 on Sunday. Now the Golden Eagles were looking to bounce back and jumped on MSU early with a 3-0 lead through the first three innings. MSU starting pitcher Kylie Patrick was pulled after 1 1/3 innings for Mendez. She only gave up two hits, but walked five, which led to three earned runs. The Beavers mounted their comeback with two RBI singles in the fourth from Zoya Robbins and Wright, plus manufactured two more runs in the fifth off a throwing error and an RBI groundout. Trailing 4-3, Crookston loaded the bases on Mendez with one out in the top of the seventh. A force out at home had MSU on the verge of escaping, but Leah Macias shot a single through the left side to tie the game. The Beavers got a runner on base with no outs in the bottom half of the seventh, but couldn’t move her over — popping up a bunt and then getting caught trying to steal second base. The first four Crookston batters in the eighth inning reach base off Mendez, including the decisive four-run blast by Morales. Staples came in and got the final three outs. MSU managed to get the tying runner up to the plate in the bottom half after a two-out RBI single by Wright and a throwing error from third base over to first. 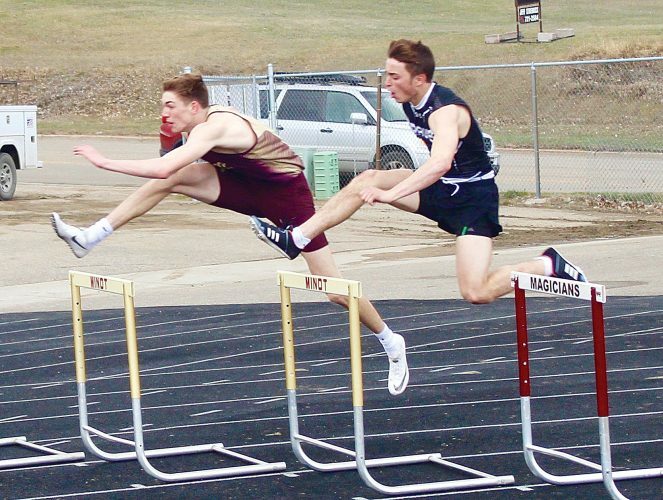 This rally, however, came a little too late as Crookston held on for a 9-6 win. The Beavers take a week off before returning to the bubble on Feb. 22-23 for four more games.